Brain sensors and electronic tags that dissolve. Boosting the potential of renewable energy sources. These are examples of the latest research from two pioneering scientists selected as this year’s Kavli lecturers at the 247th National Meeting & Exposition of the American Chemical Society (ACS). The meeting features more than 10,000 presentations from the frontiers of chemical research, and is being held here through Thursday. Two of these talks are supported by The Kavli Foundation, a philanthropic organization that encourages basic scientific innovation. These lectures, which are a highlight of the conference, shine a spotlight on the work of both young and established researchers who are pushing the boundaries of science to address some of the world’s most pressing problems. Rogers’ team is working to incorporate some of these elements in sensors that can, for example, detect the early onset of swelling and temperature changes in the brain after head injuries and then vanish when they’re no longer needed. Today, devices designed for these purposes are wired—they have to be implanted and later completely removed once they’re no longer needed. Rogers’ sensor could be implanted but work wirelessly and, after use, “simply disappear.” That eliminates the risk of infection and other complications associated with having to remove devices surgically. Rogers has successfully tested early prototypes of sensors in laboratory animals and envisions that such devices could be used one day in human patients. His group is also working on biodegradable radio-frequency identification tags, or RFID tags. Currently, RFIDs are produced by the billions and used in everything from jeans for accurately tracking inventory to smart cards and injected into pets. They are also found in product packaging that ends up in landfills. Using cellulose, zinc and silicon, Rogers has successfully made dissolvable RFID tags in the lab. The next step would be figuring out how to scale production up and commercialize it. Delivering the “The Kavli Foundation Emerging Leader in Chemistry Lecture” is Emily Weiss, Ph.D., of Northwestern University. Her lab is focused on getting the most power possible out of mixed and matched nanomaterials that are being developed to maximize renewable energy sources. Scientists can now engineer these materials with unprecedented precision to capture large amounts of energy—for example, from the sun and heat sources. But getting all that energy from these materials and pushing it out into the world to power up homes and gadgets have been major obstacles. As structures in materials get smaller, the interface problem becomes amplified because nanomaterials have more surface area compared to their volume. So electrons in these advanced devices have to travel across more and more interfaces, and they lose energy as heat every time. A remarkable feature of the modern integrated circuit is its ability to operate in a stable fashion, with almost perfect reliability. Recently developed classes of electronic materials create an opportunity to engineer the opposite outcome, in the form of devices that dissolve completely in water, with harmless end products. The enabled applications range from ‘green’ consumer electronics to bio-resorbable medical implants – none of which would be possible with technologies that exist today. This talk summarizes recent work on this physically ‘transient’ type of electronics, from basic advances in materials chemistry, to fundamental studies of dissolution reactions, to engineering development of complete sets of device components, sensors and integrated systems. An ‘electroceutical’ bacteriocide designed for treatment of surgical site infections provides an application example. Abstract The behavior of electrons and energy at interfaces between different types or phases of materials is an active research area of both fundamental and technological importance. Such interfaces often result in sharp free energy gradients that provide the thermodynamic driving force for some of the most crucial processes for energy conversion: migration of energy and charge carriers, conversion of excited states to mobile charge carriers, and redox-driven chemical reactions. Nanostructured materials are defined by high surface area-to-volume ratios, and should therefore be ideal for the job of energy conversion; however, they have a structural and chemical complexity that does not exist in bulk materials, and which presents a formidable challenge: mitigate or eliminate energy barriers to electron and energy flux that inevitably result from forcing dissimilar materials to meet in a spatial region of atomic dimensions. Chemical functionalization of nanostructured materials is perhaps the most versatile and powerful strategy for controlling the potential energy landscape of their interfaces, and for minimizing losses in energy conversion efficiency due to interfacial structural and electronic defects. Using metal and semiconductor nanoparticles as model systems, this talk will explore the power of tuning the chemistry at the organic-inorganic interface within colloidal semiconductor and metal nanoparticles as a strategy for controlling their structure and properties. Which Nano System Works Best for Cancer Treatment ? (Phys.org) —In current research related to improving cancer treatments, one promising area of research is the effort to find ways to selectively pinpoint and target cancer cells while minimizing effects on healthy cells. View of iron-oxide nanoparticles embedded in a polystyrene matrix as seen via a transmission electron microscope. These nanoparticles, when heated, can be applied to cancer cells in order to kill those cells. In that effort, it’s already been found in lab experiments that iron-oxide nanoparticles, when heated and then applied specifically to cancer cells, can kill those cells because cancer cells are particularly susceptible to changes in temperature. Increasing the temperature of cancer cells to over 43 degrees Celsius (about 109 degrees Fahrenheit) for a sufficient period of time can kill those cells. So, a University of Cincinnati-led team – along with researchers at Iowa State University, the University of Michigan and Shanghai Jiao Tong University – recently conducted experiments to see which iron-oxide nanoparticle configurations or arrangements might work best as a tool to deliver this killing heat directly to cancer cells, specifically to breast cancer cells. The results will be presented at the March 3-7 American Physical Society Conference in Denver by UC physics doctoral student Md Ehsan Sadat. In systematically studying four distinct magnetized nanoparticle systems with different structural and magnetic properties, the research team found that an unconfined nanoparticle system, which used an electromagnetic field to generate heat, was best able to transfer heat absorbed by cancer cells. So, from the set of nano systems studied, the researchers found that uncoated iron-oxide nanoparticles and iron-oxide nanoparticles coated with polyacrylic acid (PAA) – both of which were unconfined or not embedded in a matrix – heated quickly and to temperatures more than sufficient to kill cancer cells. Uncoated iron-oxide nanoparticles increased from a room temperature of 22 degrees Celsius to 66 degrees Celsius (about 150 degrees Fahrenheit). View of unconfined, uncoated iron-oxide nanoparticles as seen via a transmission electron microscope. These nanoparticles, when heated, can be applied to cancer cells in order to kill those cells. The goal was to determine the heating behaviors of different iron-oxide nanoparticles that varied in terms of the materials used in the nanoparticle apparatus as well as particle size, particle geometry, inter-particle spacing, physical confinement and surrounding environment since these are the key factors that strongly influence what’s called the Specific Absorption Rate (SAR), or the measured rate at which the human body can absorb energy (in this case heat) when exposed to an electromagnetic field. He added the systems’ heating behaviors were also influenced by the concentrations of nanoparticles present. The higher the concentration of nanoparticles (the greater the number of nanoparticles and the more densely collected), the lower the SAR or the rate at which the tissue was able to absorb the heat generated. All four nanoparticle systems were exposed to the same magnetic field for 35 minutes, and temperature measurements were performed at two-minute intervals. The polystyrene nanosphere, which heated to 36 degrees Celsius (about 96 degree Fahrenheit). The polystyrene nanosphere with a silica coating heated to 40 degrees Celsius (104 degrees Fahrenheit). (Nanowerk Spotlight) By Michael Berger. Copyright © Nanowerk The integration of consumer electronics with advanced imaging and analytical platforms holds great promises for medical point-of-care diagnostics and environmental rapid field testing for pollutants and viruses. For instance, in a recent Nanowerk Spotlight we reported on the use of smartphones to detect single nanoparticles and viruses. In this work, a research group led by Aydogan Ozcan, a professor in the Electrical and Bioengineering Department at UCLA and Associate Director of the California NanoSystems Institute (CNSI), created a field-portable fluorescence microscopy platform installed on a smartphone for imaging of individual nanoparticles as well as viruses using a light-weight and compact opto-mechanical attachment to the existing camera module of the cellphone. 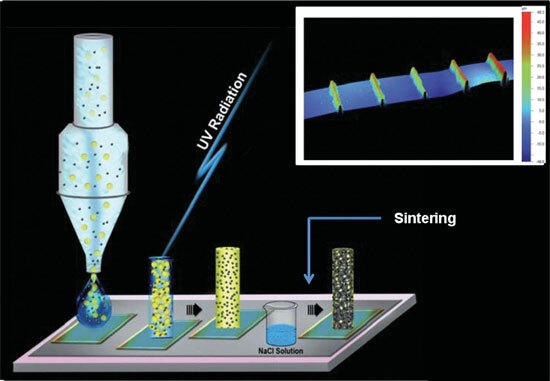 Over the past decade, RDTs – which are in general based on light scattering off surface-functionalized metallic nanoparticles – have emerged as a quick and cost-effective method to screen various diseases and have provided various advantages for tackling public health problems including more effective tracking/monitoring of chronic conditions, infectious diseases and widespread medical testing by minimally trained medical personnel or community healthcare workers. The new Google Glass-based diagnostic technology could improve individual tracking of dangerous conditions or diseases, public health monitoring and rapid response in disaster relief areas or quarantine zones. This is how it works: The user takes a photo of the RDT device through the camera system in Google Glass. 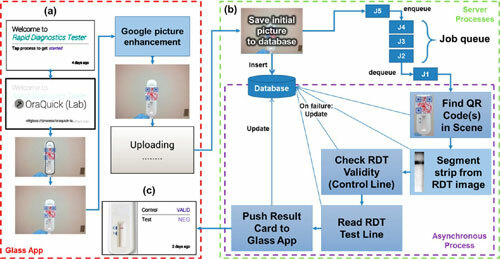 Using a Quick Response (QR) code identifier, which is custom-designed and attached to each RDT cassette, this custom-written Glass application is capable of automatically finding and identifying the type of the RDT of interest, along with other information (e.g., patient data) that can be linked to the same QR code. The data is transmitted to a central server which has been set up for fast and high-throughput evaluation of test results coming from multiple devices simultaneously. 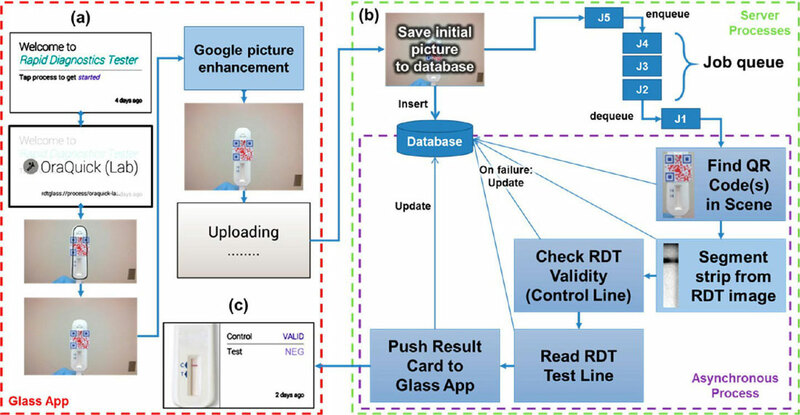 The data is processed automatically and to create a quantitative diagnostic result, which is then returned to the Google Glass user. Nanowerk News) NanoHybrids Corporation, a provider of nanotechnology-based contrast agents announced the launch of its new website and premium product line of gold nanoparticles specially designed to improve imaging results. The company’s initial technology platform was developed in collaboration with researchers from the Biomedical Engineering Department at The University of Texas at Austin and M.D. Anderson Cancer Center. This laminate can perform a magic trick: in the dry state it doesn’t let any gas molecule through except water and is vacuum-tight. When wet, however, nanoscale channels open up and water flows through rapidly, without any resistance. Any particle, molecule or ion that can’t squeeze through the channels is left behind. Nanowerk News) Researchers from UCLA’s Jonsson Comprehensive Cancer Center have developed an innovative cancer-fighting technique in which custom-designed nanoparticles carry chemotherapy drugs directly to tumor cells and release their cargo when triggered by a two-photon laser in the infrared red wavelength. The research findings by UCLA’s Jeffrey Zink, a professor of chemistry and biochemistry, and Fuyu Tamanoi, a professor of microbiology, immunology and molecular genetics, and their colleagues were published online Feb. 20 in the journal Small (“Two-Photon-Triggered Drug Delivery via Fluorescent Nanovalves”) and will appear in a later print edition. Nanoparticle Networks’ Design Enhanced by Theory from Cornell U. For close to two decades, Cornell scientists have developed processes for using polymers to self-assemble inorganic nanoparticles into porous structures that could revolutionize electronics, energy and more. This process has now been driven to an unprecedented level of precision using metal nanoparticles, and is supported by rigorous analysis of the theoretical details behind why and how these particles assemble with polymers. Such a deep understanding of the complex interplay between the chemistry and physics that drive complex self-assembly paves the way for these new materials to enter many applications, from electrocatalysis in fuel cells to voltage conductance in circuits. Ulrich Wiesner, the Spencer T. Olin Professor of Materials Science and Engineering, led what is probably the most comprehensive study to date of block copolymer nanoparticle self-assembly processes. The study was published online Feb. 21 in Nature Communications. From the outside, the process looks simple enough. Begin with platinum and gold particles that grow from a precursor. A chemical called a ligand coats the particles and precisely controls their size. Add to this designed molecules called block copolymers – long chains of two or three organic materials. The polymers combine with the platinum and gold nanoparticles, all of which assemble into ordered, cubic, three-dimensional structures. Etch away the polymer, and what’s left are scores of nanoparticles forming porous 3-D cubic networks. Each step – from the exact structure of the ligands, to the synthesis of the polymers – requires precise chemistry and detailed understanding of each material’s role. The Nature Communications analysis drew on the expertise of collaborators in electron tomography, energy dispersive microscopy and percolation theory. For example, collaborators from the Japan Science and Technology Agency used electron tomography to map the location of every single particle in the samples, which then could be compared with theoretical predictions. The result is a comprehensive set of design criteria that could lead to readying these particle networks for larger scale solution processing. Why pay such attention to these self-assembled nanoparticle networks? They’re made in a way that would never happen in nature or by conventional laboratory means. They are uniformly porous with high surface area and, therefore, are highly catalytic and potentially useful for energy applications. Perhaps best of all, working with polymers means cost-effective, large-scale processing could be a snap. Several decades of polymer science has given the world efficient scalability unsurpassed in the materials world – think plastics production. 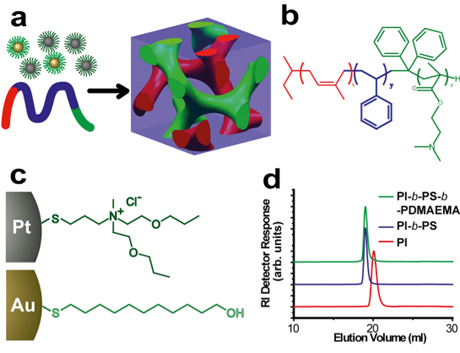 Wiesner and colleagues have proven the concept of self-assembled metal nanoparticles using block copolymer-based solution processing that goes beyond the “glass vial in a lab,” Wiesner said. “Now that we understand how it all works, our process lends itself easily to larger-scale production of such materials,” he said. Printed Electronics & Nanomaterials Applications – How Close Are We? (Nanowerk Spotlight) The term printed electronics refers to the application of printing technologies for the fabrication of electronic circuits and devices, increasingly on flexible plastic or paper substrates. Printed electronics has its origins in conductive patterns printed as part of conventional electronics, forming flexible keyboards, antennas and so on. Then came fully printed testers on batteries, electronic skin patches and other devices made entirely by printing, including batteries and displays (read more: “Printed electronics widens its scope”). Traditionally, electronic devices are mainly manufactured by photolithography, vacuum deposition, and electroless plating processes. In contrast to these multistaged, expensive, and wasteful methods, inkjet printing offers a rapid and cheap way of printing electrical circuits with commodity inkjet printers and off-the-shelf materials. A review article in Small (“Conductive Nanomaterials for Printed Electronics”) by Alexander Kamyshny and Shlomo Magdassi from The Hebrew University of Jerusalem, provides a state-of-the-art overview of the synthesis of metal nanoparticles; preparation of stable dispersions of metal nanoparticles, carbon nanotubes (CNTs) and graphene sheets; ink formulations based on these dispersions, sintering of metallic printed patterns for obtaining high electrical conductivity; and recent progress in the utilization of metal nanoparticles, carbon nanotubes, and graphene for the fabrication of various functional devices. Applications of conductive nanomaterials The authors also discuss several applications of conductive nanomaterials for the fabrication of printed electronic devices. This includes fabrication and properties of transparent conductive electrodes, which are nowadays essential features for many optoelectronic devices, and inkjet-printed devices, such as RFID tags, light emitting devices, thin-film transistors (TFTs) and solar cells. Transparent electrodes The market for transparent electrodes has grown tremendously due to wide proliferation of LCD displays, touch screens, thin-film solar cells, and light emitting devices. The most widely used material is indium tin oxide (ITO) with a market share of more than 97% of transparent conducting coatings. ITO coatings have some major drawbacks, though, and many efforts to find alternatives are based on nanomaterials – metal nanoparticles, metal nanowires, carbon nanotubes, and graphene – which can be printed directly on various substrates without etching processes. RFID tags The main elements of an RFID (Radio Frequency Identification) tag are a silicon microchip and an antenna, which provide power to the tag and are responsible for communication with a reading device. Direct inkjet printing of antennas on plastic and paper substrates with the use of metal nanoparticles inks is a promising approach to the production of low-cost RFID tags. Thin-film transistors Conductive nanomaterials are used to produce the conductive features on both inorganic and organic TFTs. See for instance our recent Nanowerk Spotlight on inkjet printing of graphene for flexible electronics or the report on inkjet printing of single-crystal films of organic semiconductors. Light-emitting devices Light emitting devices (or electroluminescent devices, ELDs) are composed of a semiconductor layer placed between two electrodes, and emit light in response to electric current. LEDs to be used for lighting, require a highly conductive grid (“shunting lines”) for homogeneous distribution of current around the lighting device. These circuits can be fabricated on various substrates including plastic, by various printing processes using conductive nanomaterials. Solar cells The first demonstration of inkjet-printed solar cells was already made in 2007 using fullerene-based ink. The results were discussed in this paper: “High Photovoltaic Performance of Inkjet Printed Polymer:Fullerene Blends”. In recent years, metal nanoparticles as well as nanowires and CNTs have been also used in solar cells fabrication as well.